The BioRad PTC-200 PCR machine is a state of the art with numerous of built-in PCR protocols used for ramping and cooling. 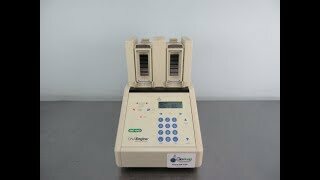 This easy to use thermocycler allows the user to generate more copies of their sensitive DNA samples which can then be processed through a DNA sequencer. Repeatability can easily be achieved with each run through the Thermal Cycler delivering you accurate results each time. With interchangeable blocks this thermal cycler can easily adapt to meet the needs of your research. This BioRad DNA Engine PCR unit comes with an In situ PCR block, that holds 16 glass slides on each side for gradient thermal cycling capabilities. This alpha block is rare, and features independently controlled chambers, thermo electric heat pumps and sensors, with multizone temperature control for excellent uniformity. This PCR alpha unit is built specifically for in situ techniques and humidified chamber hybridizations, and thanks to the independent control, two protocols can be run at the same time. This BioRad PTC-200 PCR machine has been fully inspected and is performing to expectations. All of our lab equipment comes backed with our standard warranty. Should you have any questions, please don't hesitate to contact us.